Detail of the god Pan from a painting depicting the birth of Dionysus. 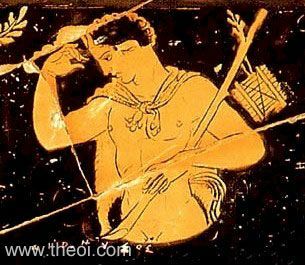 Pan is depicted from the thigh up with the horns, ears and tail of a goat. He wears an deer-skin cape and holds a branch hung with a set of pan-pipes.